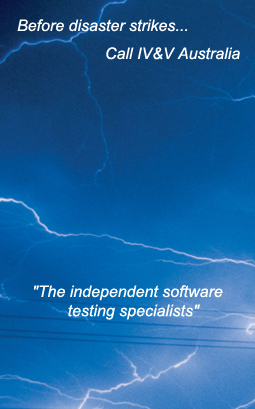 IV&V Australia are software testing specialists. The consultancy was formed in May 1996, with the aim of providing value-added software testing and IV&V services to the Technology/IT and Defence industries. Our test processes are accredited by the National Association of Testing Authorities to ISO 17025. Our office is located in Crows Nest (Sydney) NSW. Click here to download a company overview brochure. Our consultants all have significant experience in software testing and IV&V in various local and international companies, federal and state government environments and large and small commercial clients. We have worked in a wide range of application areas including HI and SMD CCA testing for e-Health applications, biomedical systems, mobile applications, voting systems, e-commerce/webs, desktop applications, client/server (incl cloud applications), and embedded systems. Our consultants undertake the full range of testing roles required on application development projects. We also employ consultants who are experienced in providing IV&V support to projects and conducting Test Process Improvement activities. Our consultants are hand-picked to provide the best specialist expertise to our customers. They are fully supported by IV&V Australia’s technical infrastructure, including management oversight, peer review and access to the IV&V Toolkit of test processes, templates and checklists. We ensure all of our consultants have access to our ongoing professional development programs, which includes exams such as the ISTQB, presentations skills and training facilitation. We provide a “value added” service. a depth of experience in software testing and understand the issues and pitfalls. a strong quality focus and process orientation in the work we do. providing ongoing management oversight of all of our staff in the field. providing peer technical support at no extra cost. our test consultants are employees, rather than contractors, so they are all familiar with IV&V Australia’s methodologies and processes, as well as the domain areas of our regular clients. a policy of assigning the same testers to a client’s successive projects, whenever possible, so the client has the benefit of domain knowledge. a policy of achieving a skills transfer with our clients – we can tailor our IV&V Toolkit of templates, checklists and processes to suit our clients, and then train their testers in their use. a policy of being highly visible in the work we do, through weekly status and risk reporting.